This programme is brilliant but...where is the BBC World Service? Is there any chance of being able to add World service programmes to a future update? 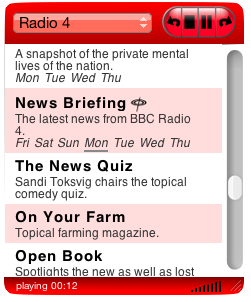 The BBC are gradually transitioning their radio streams from the ListenAgain web-site, which older versions of this widget used; to new iPlayer pages. When World Service and other stations get properly added to the iPlayer then they should show up in the widget too.